If you’re interested in outdoor construction, paving, or any other sort of improvements to your property and its landscape, you’ve come to the right place. Our company offers a broad range of paver installation and repair services, as well as many other types of landscape design works. Our professional team prides itself on its punctuality, creativity, and expertise. Complete customer satisfaction is what our experts aim for every single time. If it involves stone, cement, or brick, our team can handle it. Landscaping isn’t really just one professional field, but an umbrella that covers several different ones, including stonemasonry, engineering, water management, and others. Consequently, our team consists of specialists in all those fields, who together can bring all those necessary skills to bear. From wall construction to driveway paving to even swimming pool deck installation. Ask us about a landscape feature, and more likely than not we can build it. The hardest work when it comes to landscaping is often repairing or removing things, rather than building them. It's important not to damage the surrounding surface in the process, so as not to create a bigger problem or an aesthetic eyesore. Our company makes a point of offering repair, replacement, and removal services for most of the landscape features we can build, especially things like stone walkways, brick retaining walls, or paver driveways. Our experts believe that there’s practically nothing beyond fixing, and our team is adaptable and imaginative enough to help you work with your land and create the perfect outdoor space you’ve always been visualizing. 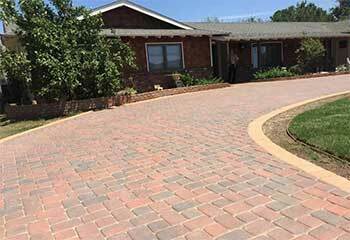 Whether it’s made from stone pavers, bricks or stamped concrete, your driveway needs to be smooth, unbroken, sufficiently wide, and ideally, it should also be easy on the eyes. Walls or fencing along a driveway can help prevent accidents and hold the earth or plant life back, as well as improve your property’s aesthetics. 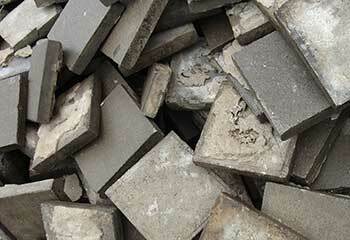 Of course, the grout between the tiles or bricks can require resealing after a while. Driveways can be very vulnerable to rain and car accident damage; even the daily traffic of arriving and departing vehicles can gradually take its toll, and some parts may need to be fixed. That's why our team offers professional driveway repair and replacement, as well as thorough oil stain cleaning services. Smaller, more delicate paved roads that connect different buildings, or driveways and backyards, can save your lawn a lot of wear and tear from trampling, and protect your indoor floors from mud or grass covered shoes. If you have pools or outbuildings, or even just an extensive garden you’d like to show off, a system of paved walkways can be just the thing to make it all accessible. With some well-chosen stone or brick pavers, you can make the paths themselves an improvement to the scenery as well. With the addition of chairs, tables, or benches, the outside part of your property can be just as much a living space as anything indoors, especially the kitchen. Even rain and harsh sunlight aren’t much of an issue when you can have parasol holders or even columns, pergolas, and gazebo-style roofs to shelter your outdoor structures from the skies. Our team can also put in barbecue pits and grill holders, as well as kitchen islands with counter and shelving space that can accommodate electricity for refrigerators and ovens, and running water to help with cooking and washing. Fountains and fish ponds, as well as other artificial water bodies, have been a favorite addition to high class gardens, parks, and guesthouses for thousands of years, and modern technology offers a greater range of options than ever before. An outdoor koi pond or an abstract water fountain will easily make for a great centerpiece for a courtyard or large patio, especially with a beautiful flagstone surrounding. Decorative pools and brooks are a complement to any garden or lawn, as well as potential holding areas for pets like fish or turtles. Sometimes, you just need to separate one area from another; either to surround your property and mark the boundaries and deter unwanted visitors, or to wall off or obscure places that you’d rather guests not enter without permission. Of course, some low brick or stone retaining walls can also serve as reinforcement to hold the soil back from unraised driveways or walkways and, depending on the lay of the land, some structures can be decorative in their own right. Whether you want a knee-high driveway lining or a fully enclosed outbuilding, our builders can set it up for you. Check out our latest projects to read some of our recent work reports. 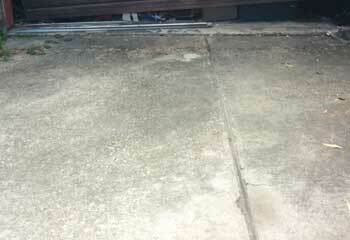 Our experts were able to remove old oil stains from this customer's driveway without having to replace any pavers. Read more here. Our team successfully replaced a natural stepping-stone walkway with concrete pavers. Read the job report here. This customer wanted to add edging to his paver driveway. Read our job report to learn how we helped. Our new pool deck looks great and we have you to thank for that. You guys did an awesome job building it. Thanks so much for everything! We christened our new outdoor kitchen last week and it was fantastic. I’m cooking out there every day now, trying to really make the most of it. Thanks for everything, guys! My old driveway used to look so bad it was driving me crazy. I can’t tell you what a relief it is to look at it now after your team repaired it. Thanks for all your hard work!